To see if you are a candidate for LASIK or PRK you may schedule a free consultation with Dr. Phillips by calling 206.622.2020. The consultation includes all of the measurements for surgery and a complete eye exam with dilation. 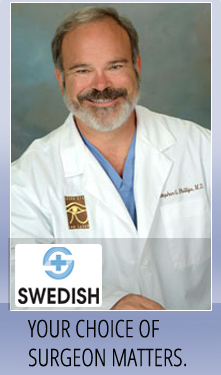 Sound Eye and Laser offers blepharoplasty surgery at our Seattle facility. Blepharoplasty involves the removal of excess skin and fat from the upper and lower eyelids. This is a very common procedure for people over the age of 50. This procedure will sometimes be covered by insurance. During upper eyelid blepharoplasty surgery, an incision is made externally in the upper eyelid crease to remove excess eyelid skin and fat. The incision is then closed precisely and sutured for healing. The incisions are made in the eyelids and are barely visible and fade over time. Naturally, there is a small amount of bruising and swelling post blepharoplasty surgery. This usually will disappear within seven days. Once the excess skin is removed patients typically recover within three days after the surgery. In lower eyelid blepharoplasty surgery an incision is made internally or externally, depending on the amount of skin present in the lower eyelid. The internal incision leaves no external incision line, and external incisions are placed below the eyelid margin to mask its appearance. Excess skin is removed and patients typically recover within three days after the procedure. For more information regarding blepharoplasty, please feel free to contact us.